Private, Personalized, Piano Instruction is the Principal Focus at FRK PIANO STUDIO of New Jersey. "Individualized, Private, Piano Lessons are Key" for maximum interest, achievement, advancement, motivation, productivity, and satisfaction. A Diverse Array of Musical Genres including classical, jazz, blues, show tunes, country, worship music, gospel, rock, and popular music is an individualized, integral part of the Students' Private Lessons. "Many of our Musical Masters started music lessons/instruction at the age of three. While most music teachers refuse to accept Very Young Students, I welcome them. Precocity in Three's, Four's, and Five's is a passion of mine." Private Piano Lessons/Instruction requires commitment on the part of the Student to dedicate a sufficient amount of time to daily practice for the achievement of prescribed weekly goals. This individualized instruction imparts discipline, responsibility, confidence, self-fulfillment, and enhanced self-esteem. These are only a fraction of the Fruits of Private Music Lessons at FRK PIANO STUDIO. The Primary, Educational Emphasis here is NOT performance perfection, but rather, the sharing of Students' skills before a supportive group. Conducted as Practice before an audience instead of a Test of one's ability, this modus operandi makes for a confidence-building, learning experience, void of anxiety, that generalizes to audience-related performances in general. Repertoire is a collection of pieces that a performer (the Pianist) knows and is prepared to perform. Typical, "cookie-cutter" teachers rarely, if ever, mention this word or put it into practice. I DO! My Students begin developing repertoires almost immediately. Without a respectable repertoire, one will never become a competent Pianist. Welcome to my site! FRK PIANO STUDIO offers the best individualized, private piano lessons for residents of New Jersey, especially Burlington County, Mercer County, and the surrounding areas. All of my private instruction focuses on individualized learning assisting each Student to maximize his personal potential better when compared to typical, traditional music lessons. Where Do I Hold My Individualized Piano Instruction in New Jersey? 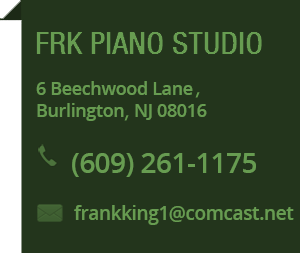 Piano Lessons with Frank King at FRK PIANO STUDIO is located at 6 Beechwood Lane, Burlington Township, New Jersey. Private, individualized piano instruction mostly serves Students from Burlington County, Mercer County, and other nearby Locations in New Jersey. Students are Invited from ANY Location in New Jersey to Study and Train with me. Private Piano Lessons are also conducted at Students' homes. My instruction is based on the Ages and Aptitudes of the Students. Individualized instruction greatly enhances the Students' capabilities accelerating productivity. If you would like to schedule individualized piano lessons at my studio, please don't hesitate to call today. For any questions regarding my individualized instruction, I would be happy to arrange a meeting with you and, if you wish, your child or children. "Delight in Discovering Your Unique Musical Ability"
Private, Personalized, Piano Lessons with Frank King in Burlington, NJ. FRK PIANO STUDIO invites Students from NJ. Some of the areas are Piano Lessons: 08016; Burlington; Burlington Township; Burlington County; Willingboro; Mount Holly; Eastampton; Westampton; Lumberton; Hainesport; Columbus; Mansfield Township; Springfield Township; Florence; Bordentown; Delran; Edgewater Park; Wrightstown; Pemberton; Pemberton Township; Browns Mills; Chesterfield; Mount Laurel; Moorestown; Cherry Hill; Princeton; Etc. I Proudly service Burlington and Mercer Counties of NJ in the Convenient Location of FRK PIANO STUDIO.